Live session, access points no more showed. This is reproducible with every type of card I've tried. If a freshly created live-usb session with persistence is launched, the NM triangle still empty, clicked it don't show access points. If instead I Edit Connections, when ready it start to scan. Bus 001 Device 004: ID 0718:0628 Imation Corp.
+ Live session, access points no more showed. This would be a driver-specific issue. Can you tell me if from the live session you can run "iw dev wlan0 scan dump" and provide me with the results? You may need to install the 'iw' package for this. The suggested command don't have output. To better understand, if at ubiquity-dm I click to see them, they are showed. But when live session is ready they aren't showed. That's fine. This means that after 'iw dev wlan0 scan' you'd likely then have results listed in nm-applet. I can't reproduce this with today's daily image (20120412) on my machine, so it's probably also device-specific. reassigned to Network Manager because this is just a graphical issue, when the accesspoint are showed they can be connected, so this isn't a linux problem. I am unable to reproduce this on multiple different hardware devices. Sorry is a mine error, #5 is not clear. - Insert the cd and let it run till the page of Language selection. - If at this point if you click NM icon access points are showed. 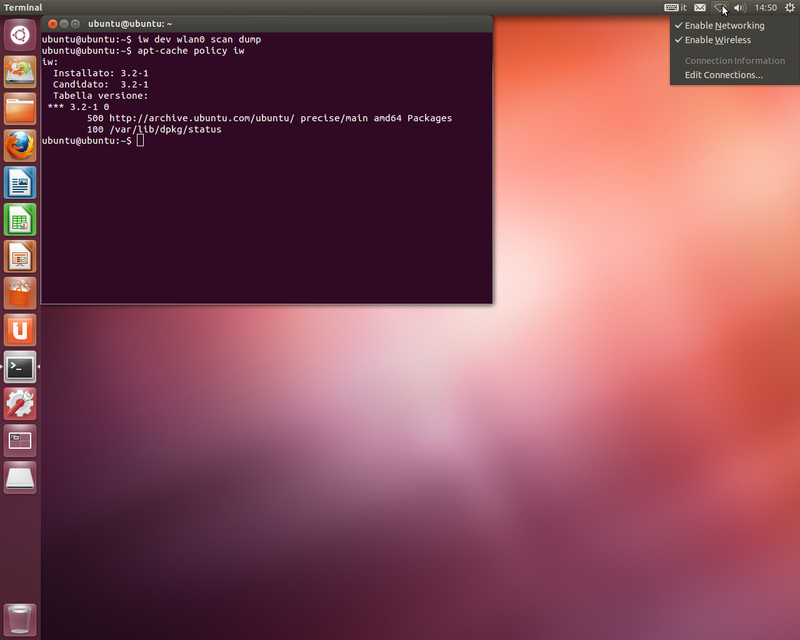 - If instead you select a language and press try Ubuntu, live session will be loaded. - When live session is started if you click on NM icon noone access point is showed, or at least, if you are lucky, they will be showed after many minutes, but not all the times. I've monitores this well. For this reason i'm thinking that linux has done well it's work as NM too, but my fear is that something is missed again between the language selection window and the live session. I observed the same behaviour on a ThinkPad T61, but after installation, not on live session. The list of access points was not visible on first login, but it was after logging out and in. However, after reinstalling the system with a new image cd (14-Apr-2012), I'm no more able to reproduce the bug. All of the devices listed above seem to be using some form of an rtl driver.